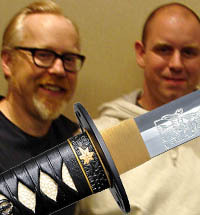 Katana maintenance can be a very intimidating thing for a beginning sword collector. 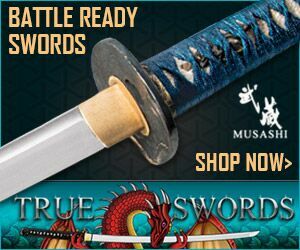 After all, as all functional swords are made from carbon steels that are prone to rust, its easy to worry that if you do it wrong, next time you draw your Katana from its sheathe you will see those dreaded black or red spots of doom..
Luckily, it's actually really simple to keep your Katana in tip top shape. You have all seen them, that collection of mysterious looking objects in a balsa wood box - sometimes they are even included as 'freebies'.. But even if they are free (which they aren't actually, the cost of the kit is built into the price) most are basically just gimmicks. 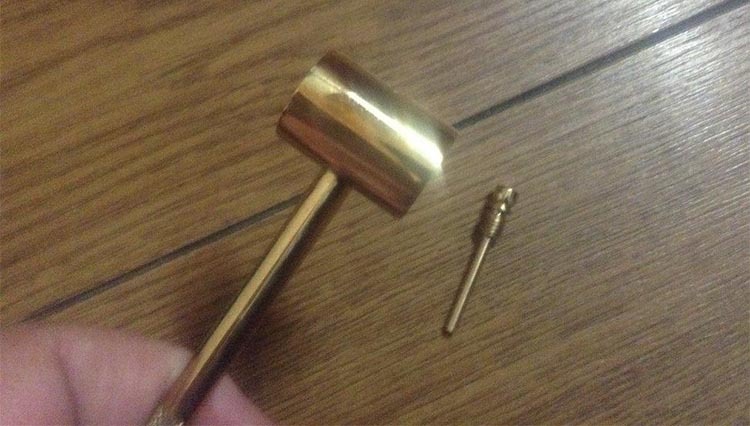 A small brass hammer used to take the mekugi pegs out. Only problem is, most are not threaded well and cannot actually be used for the purpose. A bottle of choji oil (oftentimes empty, due to hazardous material shipping regulations). An uchiko powder ball. 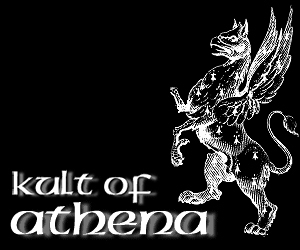 Traditionally filled with powdered whetstone, most are just filled with talcum powder and pretty useless. And some rice paper to put the oil on and a thing to store it in to protect from the air drying it out. All in all, most of the materials in there aren't original and are not actually very usable - and we offer some suggestions on how to make your own kits here. More expensive kits do contain components that ARE functional. The best ones I have seen were from Japan costing around $50 in a leather case. 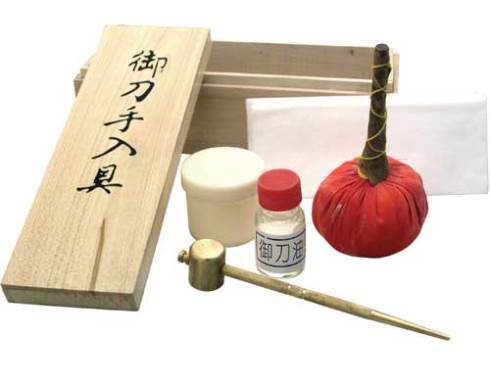 The mekugi-nuki from a high end Japanese cleaning kit. This one IS actually functional, but hardly necessary. If you are curious as to how they are used traditionally, the short video below shows you basic Katana maintenance as done in Japan. To remove the menuki, a blunted nail and small hammer works better than any specialized mekugi-nuki hammer. You can make your own choji oil - but we will get to oils in more detail in a moment. The Uchiko powder ball can be replaced by actual talcum powder (used to soak up excess oil before wiping the blade clean and dry). And rice paper, easily changed out for a clean, lint free white cloth. So now that we know what is not important for Katana maintenance, let us take a look at what IS important..
We listed the substitutions for Katana maintenance kit components, but in all honesty, there are basically only two things you need to do to keep your sword in tip top condition.. The blade should be coated in a thin protective layer at all times when not in use. 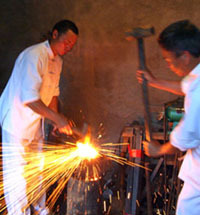 After cutting, the sword needs to be quickly cleaned to avoid staining. The first point is pretty simple - all you need to do is find a readily available oil you can apply with a cloth to the sword to coat it in a fine sheen. 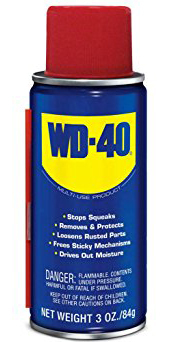 Choji oil is traditional and has a pleasant scent to it - but personally I tend to use 3 in 1 oil, Singer Machine oil, mineral oil or even WD-40 in a pinch..(the only problem with using WD40 for long term Katana maintenance is that it tends to dry out quickly). 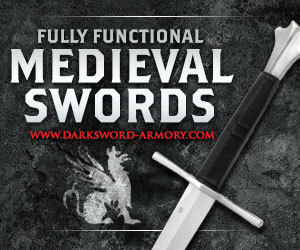 As steel is steel regardless of its shape or style, the basic sword care principles explained on our site here apply. 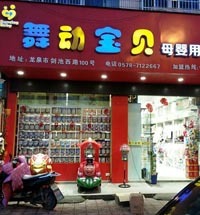 The second point is in the camp of 'prevention is better than cure'. Cutting any target that has some moisture (rolled soaked tatami mats, water filled bottles, bamboo, fruit, vegetables, etc) will stain the blade in a matter of minutes and can be stubborn to remove if left alone too long. This is especially true of fruits and vegetables as they have acids that can wreak havoc on the finish of the blade. Luckily, its easy to prevent - just keep a clean, slightly damp cloth and some WD40 or rubbing alcohol handy and give the blade a wipe down and/or a quick spray to prevent any nasty stains from forming. 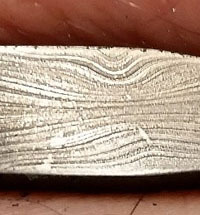 After cutting,it is a good idea to put the blade under running water for a white (point facing down so that it runs off the tip) and spray with WD40 before re-oiling as usual. In a nutshell, Katana maintenance IS as easy as ensuring the blade has a fine protective coating to protect it from rust. If you can easily see the oil, its too much - and will possibly damage the inside of the saya. Less is more, all you need is enough to protect from humidity. 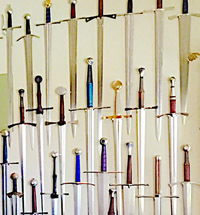 While there are a ton of oils that can be used to protect a sword - they all have one thing in common: no organic material. In other words, no cooking oil, baby oil, etc. Naturally, the first thing you want to avoid happening is that oil drying out unexpectedly - but how quickly it will dry depends on your climate, so the general rule of thumb is to watch out for hot or humid conditions and inspect the oil regularly until you get a sense for how often you need to perform oiling and basic Katana maintenance for your geographical location (as a rule of thumb, once every 1-3 months is pretty typical). Displaying the exposed blade can be problematic as dust particles will soak up some of the oil, creating patches of rust. 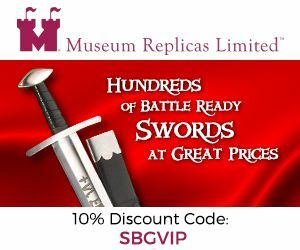 For long term protection and for protection of swords, the British museum uses Renaissance Wax - a micro-crystalline wax polish ideal for long term solutions. 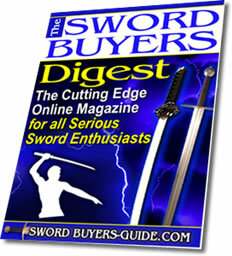 Finally, be mindful of what you cut - as stated earlier, fruits, vegetables and organic materials can easily stain a blade if the acids are left to soak into the steel and can be a bear to clean once established - so again with Katana maintenance as with anything else, prevention is better than cure. Similarly, some targets can be more damaging to a blade than you might think. For example, cardboard typically has tiny bits of ground up glass an other impurities from the recycling process in it that can really scratch up a blade. 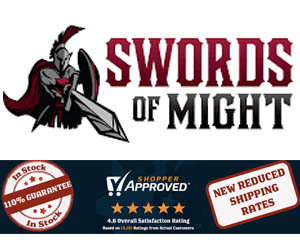 However, if your best efforts at Katana maintenance fail and you need to take measures not to maintain but restore your sword, you can find a wealth of information on how to do this on our sword care page accordingly.